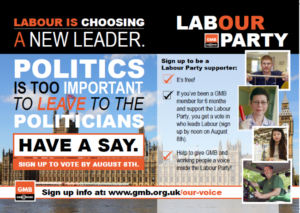 Membership of the GMB, if for over 6 months, entitles you to vote in Labour’s Leadership contest. You can register for a vote at https://support.labour.org.uk/ This is explained at the GMB’s own site “Have your say”, http://www.gmb.org.uk/our-voice. This article has active hyperlinks.